Edward cooks many of the same things in the same ways: broiled and baked fish, soups, salads, and vegetables with eggs, but I’ve noticed that he varies those dishes with seasonal ingredients. Indeed, I think Edward is pretty happy to be moving past cabbage, Brussels sprouts, potatoes and broccoli rabe, his staple vegetables over the winter, because he prepared peas in about half the dishes he cooked this past week, and mint in the other half. These are in season right now in New York, and I have come to believe that binging on seasonal foods is the way nature intended for us to eat. When my daughter was little she’d eat avocados for a month, then switch to a month of eating hot dogs, and so on. I worried she wasn’t getting proper nutrition. But when I consulted her pediatrician he said that if I looked at what she ate over the course of a year, I would see she was actually getting a pretty well rounded diet. This was a revelation to me, because it reinforces the wisdom of seasonal eating. The only way you can get a range of foods in a daily diet is if you eat some foods out of season, and those foods must, of course, be picked early and processed to accommodate the stress of shipping. Since out-of-season foods are less nutritious than seasonal foods, the whole idea of a daily food pyramid is, well, bogus. So I have totally embraced the idea of a well-rounded annual diet, and jag on foods while they are in and at their nutritional apex. So does Edward. He made soft-shelled crabs, sautéed with wine and garlic then scattered boiled peas over them, he baked whiting in a little sugo made from tomatoes and onions and peas, he stuffed squid with peas and chopped fillet of sole, grated cheese, parsley and breadcrumbs and baked until tender, and he made chicken wings with tomatoes and peas. He is also using mint like mad: broiled split black bass with mint, pasta with mint pesto, gamberoni (a kind of giant shrimp) split and braised with white wine and mint, eggs poach over onions and mint, a vegetable soup (eaten a couple of times), garnished with a dollop of mint pesto, skate wing and cuttlefish braised in white wine, onions, garlic and mint, and a salad with the leftover cuttlefish, tuna, Vidalia onions, and mint. He’s also started freezing bags of blanched peas for the winter. By the time the peas are over, he will be sick of them and happy to move on to another vegetable. But for the time being, it’s all about the peas. 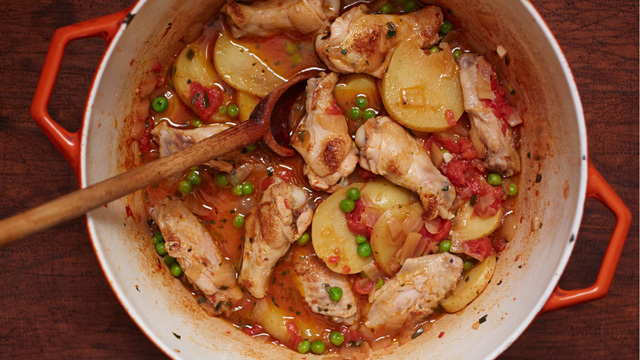 This dish is great in the winter with frozen peas, too. Heat the oil in a large sauté pan over a medium heat. Add the onion and garlic and cook, stirring frequently, for 5 minutes until the onions are translucent. Add the chicken wings and cook, turning the pieces over frequently, for 5 minutes, until the chicken wings take on some color, but are not yet browned. Add the white wine and rosemary, salt and pepper flakes to taste. Cook for 5 minutes, until the wine is reduced by half and the winey smell is gone. Add the tomatoes, cover, and cook for 10 minutes until the tomatoes are saucy and the skin on the chicken begins to separate and shrink. Add the potatoes, peas, broth and butter. Cover and boil gently for 25 minutes, until the potatoes are very tender. Loving the blog, Gena. I enjoy reading Edward’s recipes as well as his cooking and eating philosophy. Always love your pithy writing and great recipes! Great to hear from you Arlene!! Yum! We picked our first bowl of peas today up in Orange County NY so we still have a few weeks until I can try this! Love your Edward stories. I used to cut out Ed Giobbi recipes from the New York Times (before there was a website). 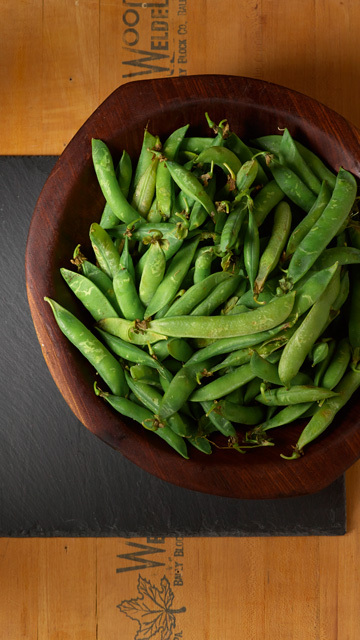 Sadly, my English peas (in northern Massachusetts) are only a few inches high at this point — so I have a while to go but am looking forward to trying this recipe. BTW, Eugenia, very nice piece in the Wall Street Journal about Dan Barber. Thanks Caroline! Once your peas are in let me know how you like the recipe!